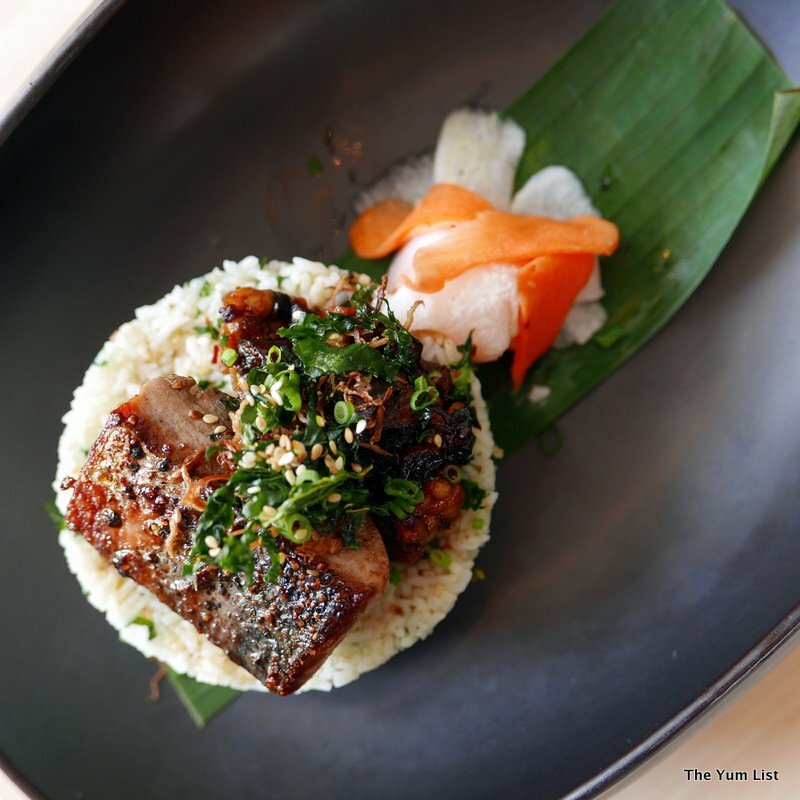 Located in the hip and cool urban space, APW, restaurant Agak Agak, gives diners a chance to sample some Malaysian favorites and Asian interpretations with creative twists; all while supporting a good cause. 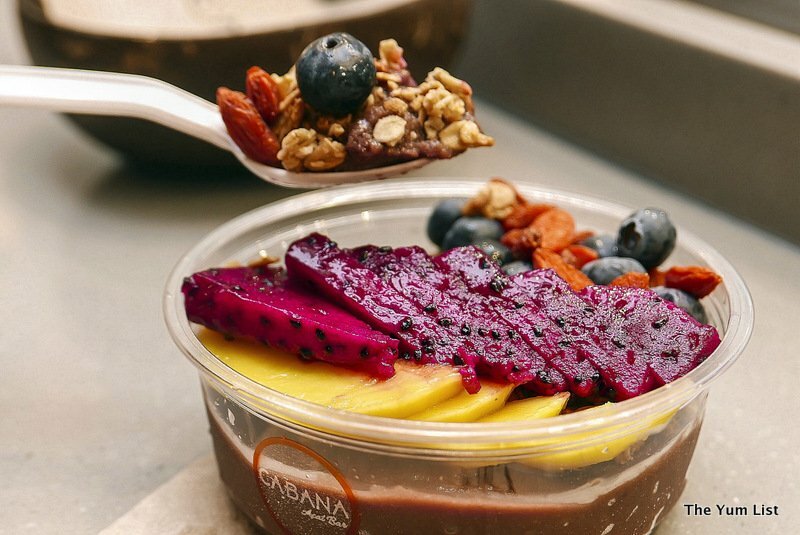 Agak Agak literally means “more or less” which to food entrepreneurs, Ili and Basira, translate to “over time, with practice and confidence, perfection is attainable when you trust yourself to just be.” The concept of Agak Agak is a timely one. The restaurant aims to redefine the Malaysian service industry and integrate some of the famous Malaysian hospitality into dining experiences. Not only that, one of the main goals of Agak Agak is to give underprivileged youth an alternative way to approach education and ideally a way to open doors through a one year apprenticeship in the food and beverage industry. Therefore, Agak Agak not only wants to help disadvantaged youth but it also strives to lift the image of the food and beverage industry in Malaysia through giving time and value to the development of its employees. 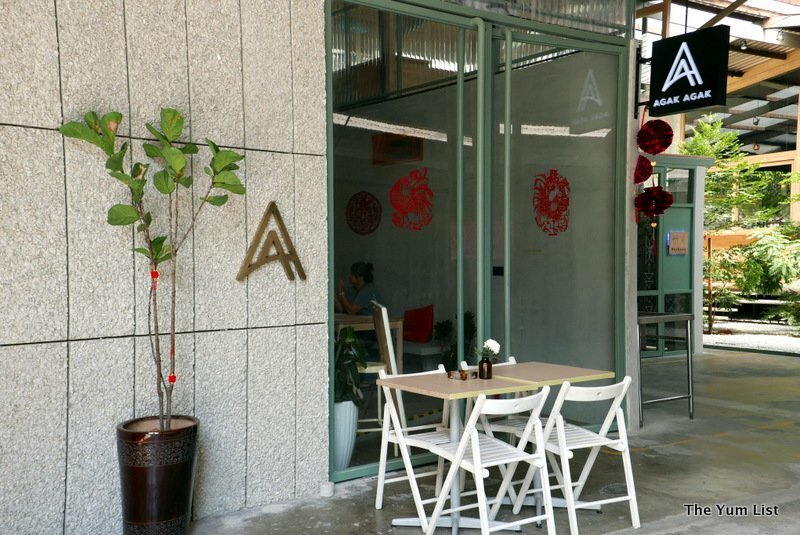 APW is one of Kuala Lumpur’s places to be at the moment. It offers a number of dining options, a barber shop, and a huge parking lot with a reasonable fee for the day. Furthermore, the outdoor open space, complete with stage and shade is begging for Malaysian artists and entrepreneurs to design a weekend market here. Inside Agak Agak, at 4 pm on a Friday afternoon, it is full, with groups of 2-8 people brainstorming ideas, having an afternoon cake or finishing up their late lunch. The inviting space with an open kitchen and a low island bar to pull up a stool and talk to the staff, makes it an ideal think space to jot down one’s musings individually or generate ideas with a group about a future, innovative project. It was an unusually hot day in Kuala Lumpur and after driving across with the air conditioning on full blast, Monica and I were still feeling rather parched. Agak Agak offers a number of regular cafe style drinks such as Malaysian coffee and tea as well as an assortment of tea bags. However, their true speciality is their sodas mixed with homemade syrups, fresh purees and dehydrated fruits. 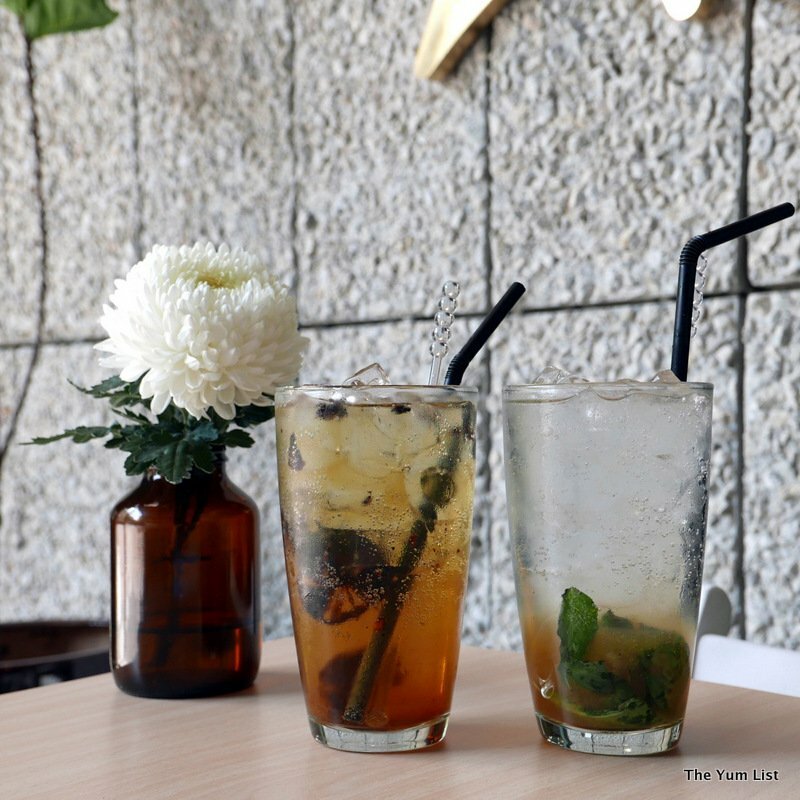 We opted for the Assam and Burnt Lime soda (RM 13.90) and the Pear and Basil soda (RM 13.90). The Assam and Burnt Lime came with the aromatic but not overpowering flavors of assam boi, as well as dehydrated lime slices that gave the drink a welcome touch of sour. While the Pear and Basil soda, had a little more sweet with a well blended puree easy to blend into the soda, it was countered by the crisp basil leaves. Nizram, Agak Agak’s finance director, had some recommendations for us to get a good idea of what the menu was all about. 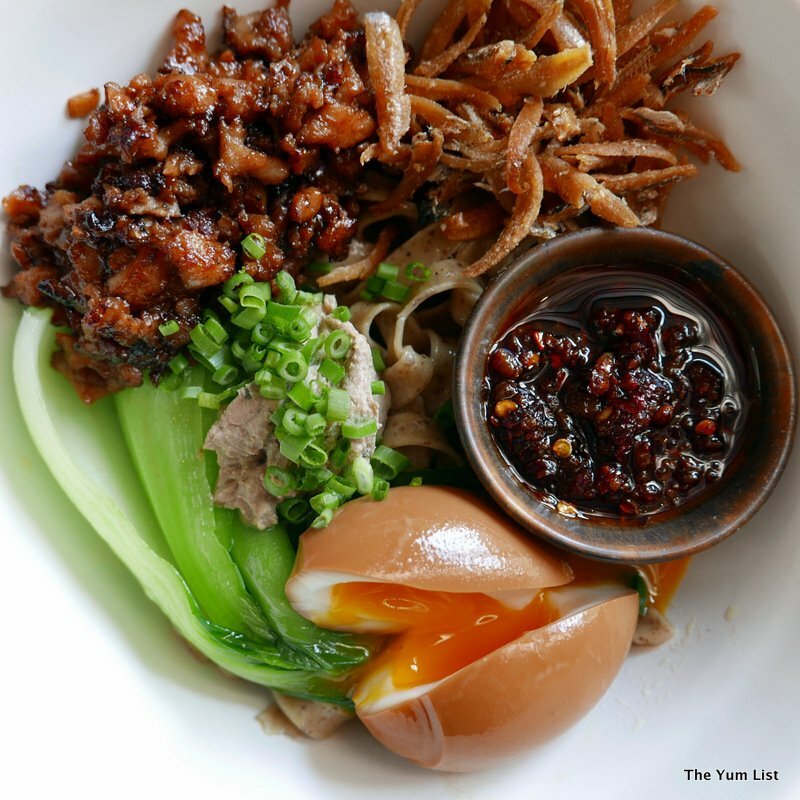 We started with the Chili Paté Mee (RM 32), which is a play on Malaysian pan mee, served with homemade rye noodles (which I could have eaten all on their own), minced chicken, homemade sambal, kicap eggs (Malaysia’s version of Japanese Onsen eggs) and a dollop of paté. This was a tasty blend of Asian flavors softened with the addition of the creamy chicken paste. Delighted with the first recommendation, we moved on to the Manguk Tongkol (RM 27), which is pan-seared local tuna, served with a fluffy rice mixed with dried seaweed (also made in-house). The saltiness of this dish was pleasantly sweetened with some hand crafted nutty tempeh, and roasted eggplant. This dish is served with a side of light ginger chicken broth so each bite can be as enjoyable as the last when you take the time to refresh your mouth with a spoonful of soup. 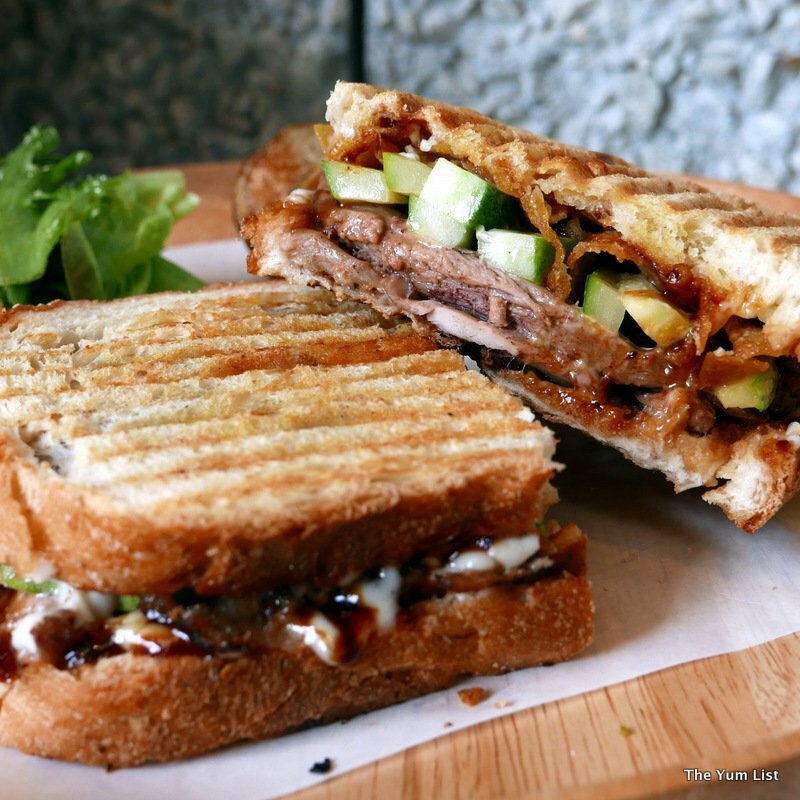 Agak Agak offers a variety of sandwiches, and we chose to sample the Duck Hoisin (RM 26). 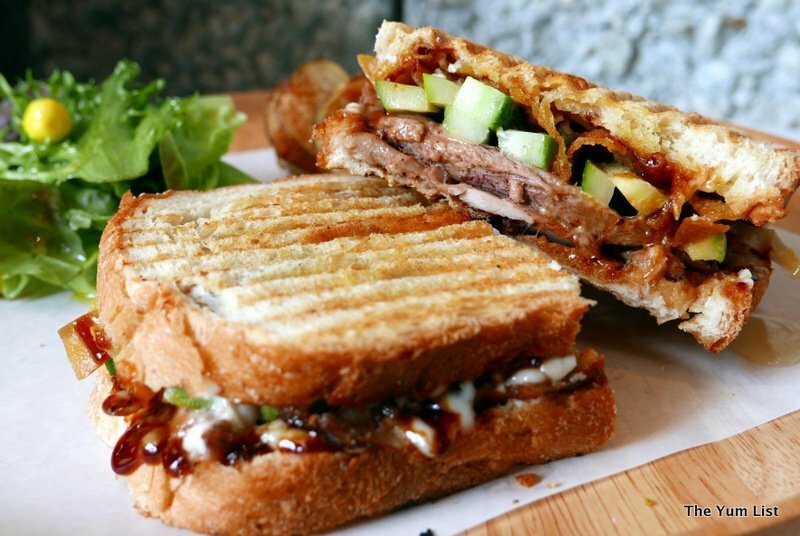 This sandwich, served on toasted bread, is layered with refreshing strips of cucumber, the crispy skin and tender meat of duck reminiscent of Peking duck dishes, and brown sugar sweet soy. The savory homemade Hoisin sauce is a treat and definitely peeked my interest to come back and try some of the other sandwich dishes. It was time for dessert and Monica and I had a hard time choosing but we restrained ourselves to two choices. Having said that, I am dying to go back and try the Miso Caramel brownies, which I have not sampled yet. Instead, we decided to be more adventurous with our dessert choices and sample more local-inspired plates, as the dishes we had sampled previously had surpassed our expectations. 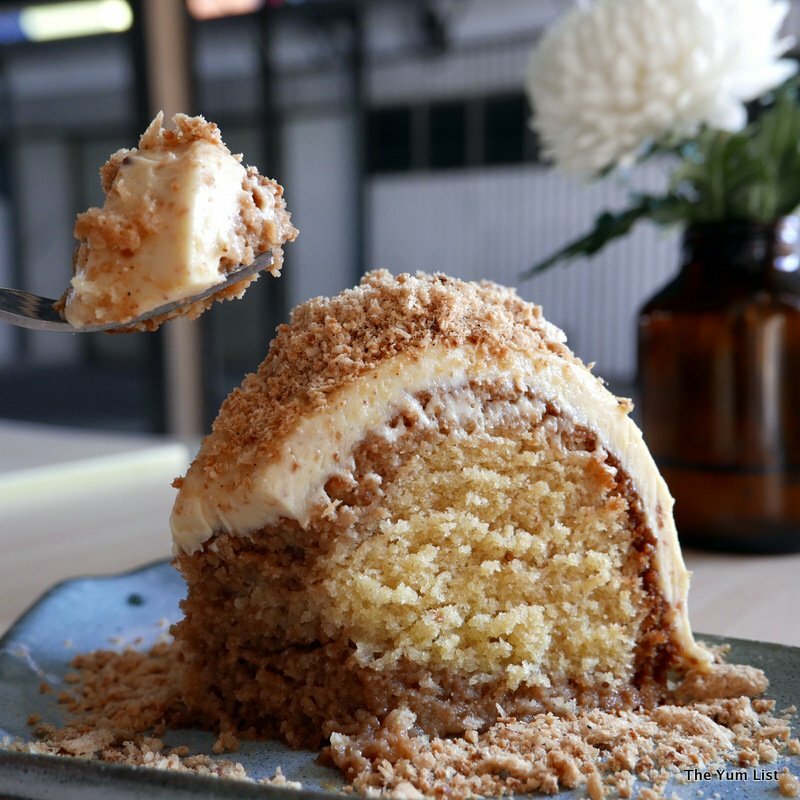 First off, we sampled the moist Kacang Tumbuk Bundt Cake, (RM 14) which offered an explosion of different peanutty flavors in the crumbly outer coating of the cake, as well as the soaked fluffy inside. Smothered in a pretty salty icing, each bite had different layers of complexity and I had to stop myself from sitting there and doing too much mindful eating as I was truly enjoying every forkful. We had one more dish, Pulut Hitam Cheese Tart (RM 14), to go and I was a little nervous going in. The appearance of the dessert itself was beautiful. 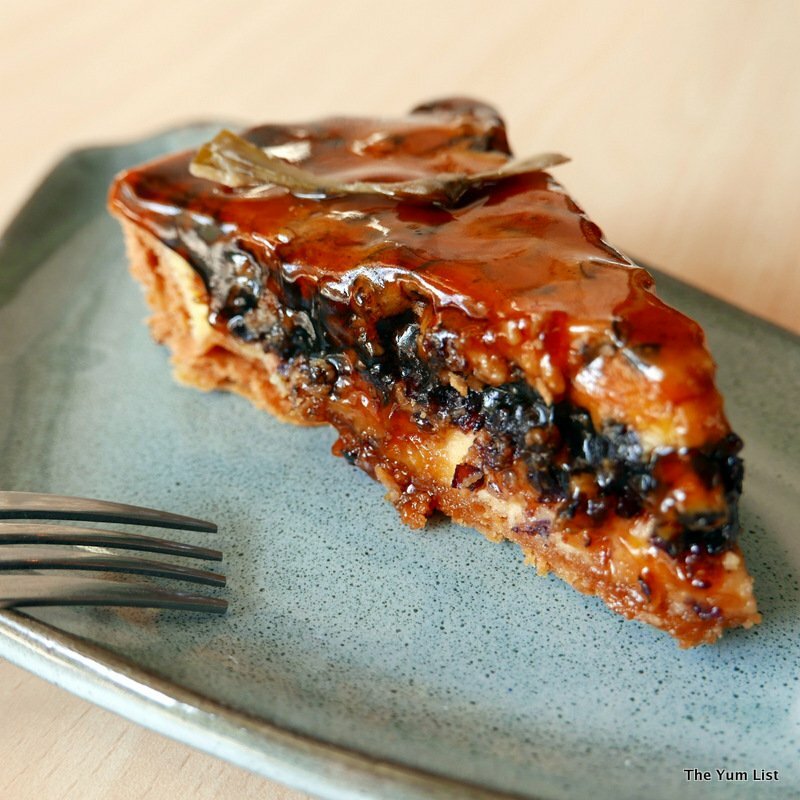 It looked like a cheesecake brownie with a glistening layer of sweetness and a buttery pastry crust, but the black glutinous rice part had my western roots raising doubts. Still, I wanted to try it as the Kacang Tumbuk had surpassed my expectations. 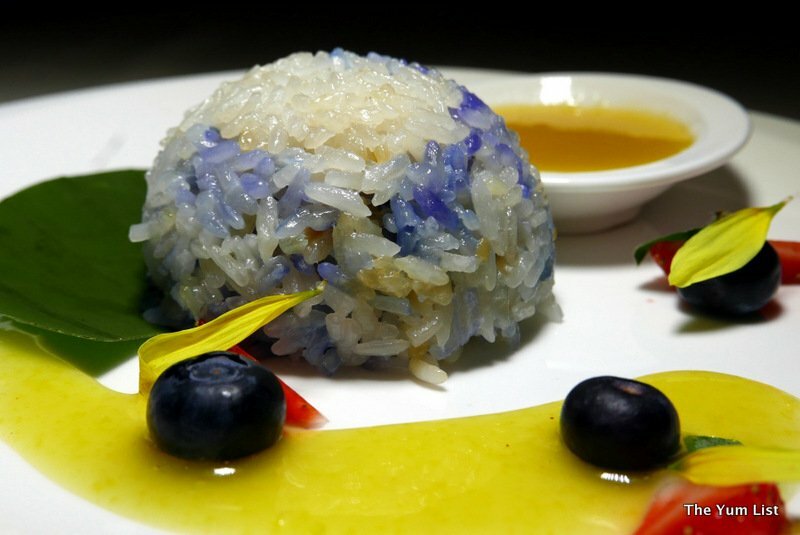 The fragrant black glutinous rice was well textured, soft and rich with a smidgen of salt, and the cheesy creamy custard gently complemented these flavors. Agak Agak was a refreshing surprise. Both the food and the concept are uplifting and inspirational and offer some traditional Malaysian flavors with simple but effective contemporary twists. I am going to love their pulut hitam cheese tart! Very nice! I have had a cheese danish before, but never a cheese tart. I like the name – that’s how I cook, agak agak – no recipe, no measurement…follow the nose or the tongue…or one’s instincts. Thanks Suitapui for this insight. These recipes felt like they were based on someone’s instincts. They were thoughtful and creative blends of textures and flavors . Sandwich and tart looks so yummy. The tart would be a no no for loosing weight. Duck Hoisin Sandwich & cakes looks delish ! Both are reasons that I want to go back. The cake blew me away especially because I am not usually taken by Asian sweets. Now that looks delicious. I’d like to try the cheesecake. Those desserts are making me drool. Have to agree those desserts look yummy. I never though Malay food could look so good. This looks very modern. Nice plating. Good concept. Don’t mind spending my money here. Lots to see in this APW! Even the sandwich looks good. Good to see more people using their skill to help others. I would need a couple of visits to try everything I want to taste here. Is that a wild rice base for the cheesecake? I didn’t know Malaysian cuisine could be so exciting! This area seems to be really booming. Must make a visit. The only place I’ve been to at APW is the coffee place from Singapore. I can’t wait to explore more. This Malaysian place seems interesting. I haven’t eaten much Malay foid as I find it too oily and intense. This looks different. Need to give Malay food a try again. I’d come just for dessert! There are many recipes I would like to taste here. You ate all of that! What is your secret in staying slim? Can’t wait to give this place a go. I’ve been looking for Malay food that has more of a contemporary take. Thanks for the list on APW. I see there is good variety here.